The United States Secretary of Housing and Urban Development (or HUD Secretary) is the head of the United States Department of Housing and Urban Development, a member of the President's Cabinet, and thirteenth in the Presidential line of succession. The post was created with the formation of the Department of Housing and Urban Development on September 9, 1965, by President Lyndon B. Johnson's signing of the Department of Housing and Urban Development Act (Pub.L. 89–174) into law. The department's mission is "to increase homeownership, support community development and increase access to affordable housing free from discrimination." The current HUD secretary is Ben Carson, who was nominated by President Donald Trump and approved by the Senate on March 2, 2017. 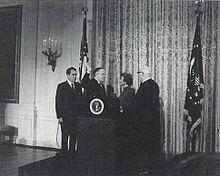 George W. Romney was sworn in as Secretary of Housing and Urban Development on January 22, 1969, with President Richard Nixon in attendance. As of April 2019, there are nine living former Secretaries of Housing and Urban Development (with all Secretaries that have served since 1993 still living), the oldest being Maurice E. Landrieu (served 1979–1981, born 1930). The most recent Secretary of Housing and Urban Development to die was James T. Lynn (served 1973–1975, born 1927), who died on December 6, 2010. The most recently-serving Secretary to die was Jack Kemp (served 1989–1993, born 1935) on May 2, 2009. ^ "3 U.S. Code § 19 - Vacancy in offices of both President and Vice President; officers eligible to act". LII / Legal Information Institute. Retrieved July 17, 2018. ^ "HUD History". U.S. Department of Housing and Urban Development. Archived from the original on May 27, 2010. Retrieved January 10, 2010. ^ "Mission". U.S. Department of Housing and Urban Development. Archived from the original on May 27, 2010. Retrieved January 10, 2010. ^ Reuters (November 23, 2016). "Ben Carson accepts position as HUD secretary, maybe?". New York Post. Retrieved November 23, 2016.